Fabulous design elements, creative use of color, usual shape, some funky die cutting? This is one of my most memorable business card designs. I discovered it yesterday during a spring clean, it is tatty and scribbled on but has a great story associated with it. 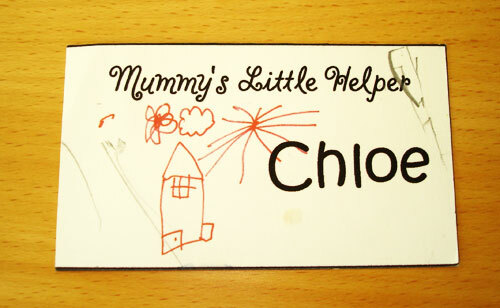 This card was created about 9 years ago and featured the artwork of my then 3 1/2 year old daughter, Chloe. I was going to a late afternoon small business trade show to do a little networking but had no sitter so decided to take my little one along. I thought it would be fun to make her some business cards to hand out. She drew me a picture which I scanned, quickly put together this unique card and printed a bundle out on my desktop printer. Her cards were a huge success and contacts I have today from back then not only remember them but still have them. How many business cards do you have from 9 years ago? This entry was posted in Chicago Graphic Design, Uncategorized. Bookmark the permalink. However there are no geographical boundaries to our services and we are happy to work with you whatever your location. Indigo Image, The Chicago Web Designer, is a Chicago website design and graphic design company with 19+ years experience. Located in the North Shore area of Chicago.